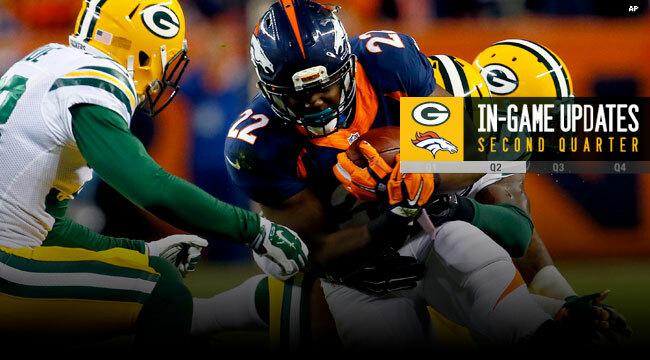 DENVER — Down by 17 points, the Packers finally got on the board late in the second quarter to head into the locker room down, 17-7, to the Denver Broncos at Sports Authority Field at Mile High on Sunday night. The Broncos added to their lead just a couple of plays into the second quarter. QB Peyton Manning hit WR Demaryius Thomas down the sideline for a 47-yard gain to the Green Bay 5. After an offensive pass interference penalty backed Denver up to the 15, RB Ronnie Hillman ran it in from there to put the Broncos ahead 14-0 less than a minute into the second. The Packers didn’t respond, going three-and-out despite gaining 8 yards on a first-down pass. RB Eddie Lacy was stuffed on two straight runs, and Green Bay punted for the third time in three possessions. The Packers also lost CB Quinten Rollins to a shoulder injury. He was announced as questionable to return. The Broncos went right back to work, getting an 18-yard completion to TE Owen Daniels and runs of 8 and 19 yards by RB C.J. Anderson. Hillman added a 7-yard run, setting up a 50-yard field goal by K Brandon McManus for a 17-0 lead with 7:46 left in the quarter. The Packers finally got on the board, going 80 yards in 10 plays to get within 17-7. QB Aaron Rodgers started the drive with a 14-yard scramble, and then he completed an 11-yard pass to TE Richard Rodgers to convert on third down. On the next third down, the Broncos were called for roughing the passer, and the Packers followed with runs by WR Randall Cobb and Lacy for 10 and 15 yards, respectively. Lacy then finished the drive with a 2-yard plunge with 2:58 left in the half. On their final drive of the half, the Broncos used passes of 11 yards to WR Emmanuel Sanders, 10 yards to Daniels, 15 to WR Bennie Fowler and 11 to Sanders to get inside the Green Bay 40. Back-to-back penalties on Broncos offensive lineman Max Garcia backed Denver up into its own territory, and the drive stalled there.